In this Photoshop tutorial, we'll learn how to give text a ghostly, supernatural look to it using a couple of simple blur filters. I'll be using Photoshop CS5 throughout the tutorial but any recent version of Photoshop will work. The Layers panel showing the two layers currently in the document. Go to Layer > Rasterize > Type. Once text has been rasterized (converted to pixels), it's no longer editable. The new layer appears above the original in the Layers panel. You should now have 5 layers in total. Select the original text layer. 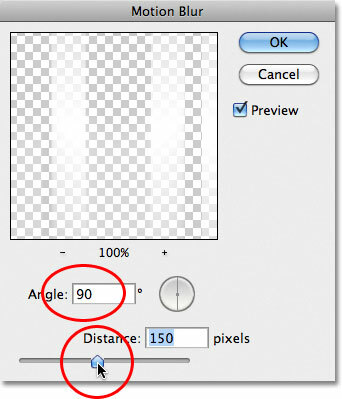 Set the Angle to 90°, then drag the Distance slider to apply blurring. The effect after adding a vertical motion blur. Select the first "copy" layer. Change the Angle to 0°. 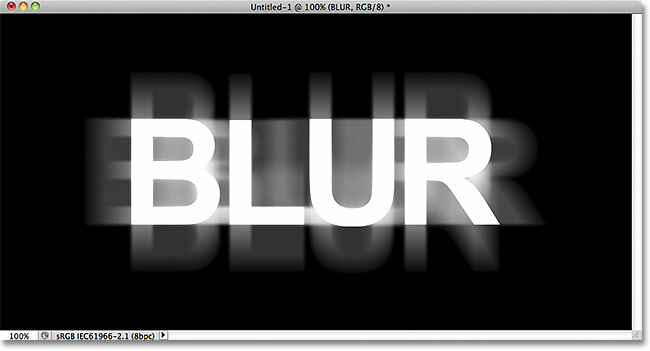 Vertical and horizontal motion blur has been added to the text. Go to Layer > Merge Down, or press Ctrl+E (Win) / Command+E (Mac). The horizontal and vertical motion blur effects are now on the same layer. Increase the Radius value to around 2 pixels. Select the "copy 2" text layer above the merged layer. Increasing the Radius value to 8 pixels. The image after applying the Gaussian Blur filter to the text. Go to Layer > Merge Down, or press Ctrl+E (Win) / Command+E (Mac) to merge the top two layers together. Choose the Foreground to Background (white to black) gradient in the top left corner. Click on the Reflected Gradient icon in the Options Bar. Click in the center of the text, then hold Shift and drag to the top of the text. The main text now fades away towards the top and bottom of the letters. Only the middle of the word remains 100% visible. A copy of the top layer appears above the original. The glow around the text is now more intense. Press Ctrl+J (Win) / Command+J (Mac) again if needed to make another copy of the blurred text layer. The text after bumping the glow effect up even further. Choose Hue/Saturation from the list. Select Colorize, then set Hue to 123 and Saturation to 40.